The Controllers and Human Machine Interface (HMI) solutions from Micromax Technology are designed to help you with any and all aspects of monitoring, logging and controlling your data. 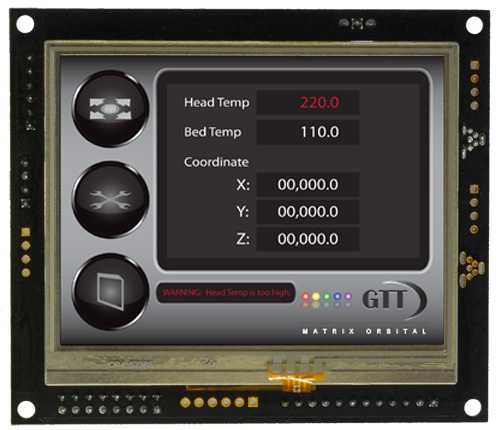 Matrix Orbital’s Graphic TFT is a feature rich intelligent display which combines top of the line TFT LCD’s with integrated touch screens, on-board memory for custom fonts, graphics, animations and a piezo buzzer for audio feedback. The displays combine Matrix Orbital’s years of experience in the serial interface field with a full colour display using and easy to use intelligent interface that can also be tailored. The Matrix Orbital EVE product range utilises FTDI’s second generation Embedded Video Engine (EVE) to control, render, manage and display complex graphics on a full colour TFT touch screen. It has 1MB of graphics RAM, allowing motion-JPEG encoded AVI videos to be played back in both portrait and landscape mode. Data can be displayed through a set of widgets such as gauges, spinners, sliders and bar graphs. Additional features include added touch control hardware, capable of recognising and tracking touch movement and providing notification for up to 255 touch objects. Mono 8-bit linear audio wave playback at sampling frequencies from 8 kHz to 48 kHz is made possible by the built in sound synthesizer and digital filter. The EVE 2 communicates using SPI protocol, and can be configured for quad SPI communication. Using SPI communication protocol makes the EVE 2 compatible with many microcontrollers available on the market, including the FTDI FT900, NPX 17XX, Arduino and many more. With built-in graphics operations and support for multiple widgets, development of a high-quality user interface screens is simplified. 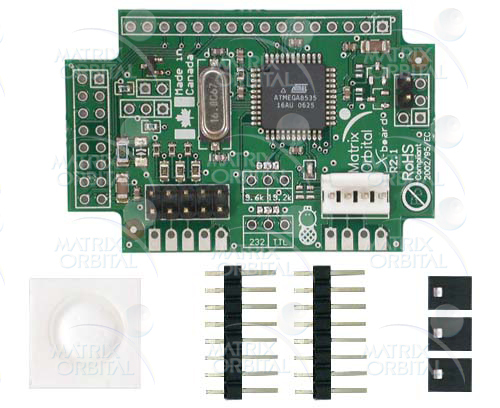 The Matrix Orbital DevDevil is a product development board which provides all of the functionality of an alphanumeric display in a project development friendly package. A variety of colour options are offered for both the 20 characters by 2 lines and 20 characters by 4 lines display models. The DevDevil opens the door to a world of exciting display possibilities. RS232, USB, TTL, and I2C protocols offered through a dynamic switch block, standard headers for all protocols are offered on the board, as well as a variety of input power options. Powering up the DevDevil can be as easy as connecting to the mini-USB connector on board. Alternate power options include an AC adapter, power through the DB9 header, and 4 pin data/power input. Micromax Technology supplier, Matrix Orbital, is the original manufacturer of PC Bay Inserts. They have developed a 5¼” PC drive bay insert with a display in response to customer demand for an effortless way to mount our displays in PC’s. The inserts were designed as a light weight, high quality product. Using coated rust-resistant steel for the mounting bracket and a Lexan face plate, these inserts will stand up to everyday wear-and-tear. Our PC Bay Inserts are available in two sizes: single 5¼” drive bay size and a double 5¼” drive bay available in black, brushed aluminum, or beige and come with our without a keypad. Available in RS232 or USB. When you order a PC Drive Bay Insert, it comes pre-assembled so you only need a Philips screw driver to put it inside your computer. The X-Board is the simple solution for an economical interface board. Add Matrix Orbital’s intelligence to your existing parallel character LCD or VFD for quick and easy prototyping. Features include Matrix Orbital’s industry standard intelligence, 3 GPO’s, software controlled back light and contrast, and supports a variety of interfaces. Use the S-Series for serial and TTL, the I-Series for I2Cor the U-Series for USB. 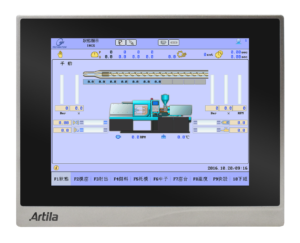 The innovative Linux-Ready ARM-based panel PC, featuring a 12” robust resistive touch TFT LCD display. Featuring the QT5 library, support 2D / 3D graphics accelerator and rugged ARM processor coupled with the open Linux operating system. Easy operation via LXDC desktop environment (Firefox/Chrome browser) and virtual keyboard. The HC-3120 is flexible and can be configured to any specific application requirements. Why work with Micromax Technology? We represent reputable, reliable and high quality global brands. We have a team of specialised engineers with decades of experience in providing technological recommendations for problem resolution. We have an Australian-based Warranty and Support Centre serviced by our field application engineers. Call 1300 906 911 or complete our form and we will get back to you.